All 55 staff employed at a Cambridge hotel will lose their jobs when it closes for a two-year refurbishment. The University Arms Hotel on Regent Street in the city will close in September and reopen in spring 2016. A spokesman for the owners said 200 people would be employed during building work and about 100 staff would be taken on when it reopens. He said staff currently employed at the hotel would be able to reapply for jobs in two years' time. Refurbishment plans for the hotel, which opened with just 15 bedrooms in 1834, were approved by Cambridge City Council in November. 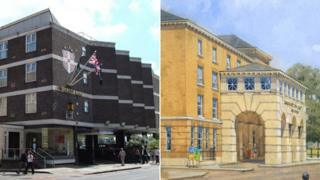 They include removal of 1960s and 1970s additions, new vehicle access and 71 new bedrooms, making a total of 190. No-one employed at the University Arms Hotel was available to comment on the redundancies.